By Danni Rocket: With the official word on the site for the final of the Cruiserweight World Boxing Super Series expected any day now, and the finalist in both weight classes (Oleksandr Usyk, Murat Gassiev, Callum Smith, and recently announced George Groves replacement Chris Eubank Jr.) now training for their fights, the first WBSS is coming to an end. Despite not being embraced by the major US television companies, and running in to several hiccups, the tournaments have been considered a huge success. So much so that the organizers have already started planning the next series. 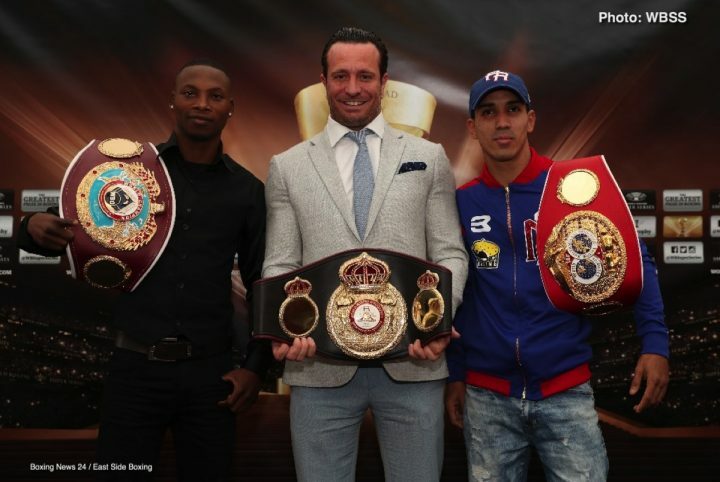 In a statement made by Kalle Sauerland after the George Groves vs. Chris Eubank Jr. fight he said the weight classes they were looking at were the following: Super Flyweight, Bantamweight, Featherweight, Lightweight, Light Heavyweight and Cruiserweight again. It is now known that Bantamweight and Light Welterweight will be two of the three classes, so in part one of this article I’d like to run through my pick of the 118lbs fighters I’d like to see face off and my reasons for selecting them. Let’s get the currently confirmed champions in the Bantamweight division out of the way to start with. They are WBA “Super” Champion Ryan Burnett, the WBO Champion is Zolani Tete, the recently crowned IBF Champion Emmanuel Rodriguez, the winner of the bout between WBA “Regular” Champion Jamie McDonnell and “The Monster” Naoya Inoue, and possibly the loser also though this hasn’t yet been confirmed. The WBC belt is vacant, as are the IBO, The Ring Magazine and the Linear titles. For the sake of this article only the winner of the McDonnell vs Inoue fight will be taken into account, as that is the only confirm fighter at this stage. The WBA has made a promise in recent years to reduce the number of champions in each weight class, and I would wager money that they would pressure WBA “Interim” Champion Reymart Gaballo (yes, a THIRD WBA Champion in the 118lbs weight class!) to take part, or risk being stripped of his paper title. He hasn’t currently got a fight scheduled, and I feel that reducing “Champions” is as good a reason as any to be entered into the tournament and therefore I’d like to see Gaballo included. So, as I see it you have the following fighters almost guaranteed to be entered: Burnett, Tete, Rodriguez, Gaballo and the winner of McDonnell and Inoue, most likely the latter. Now we just need to find the last three fighters. My first pick is not very original, but I’d like to see Juan Carlos Payano there. He’s come back from his one and only loss to Rau’shee Warren and won his last three fights and is now ranked WBO #3, WBC #5 and WBA #5. He’s also a fairly well-known fighter for the lower weight classes, and although he is from the Dominican Republic, he lives and fights out of Miami, Florida. This would hopefully be enough to get the US media’s attention and make it a true World Boxing Super Series. My second pick would be Liborio Solis, as I feel that above all the WBA owe him a title shot. He last two fights where both against Jamie McDonnell, and both were controversial. The first was awarded to the Brit via highly controversial Unanimous Decision, and the rematch ended as a No Decision, after an accidental head clash left McDonnell in no position to continue. He is currently WBA #3 and WBC #8. My last pick is someone I’m sure many people will never have heard of. John Mark Yap is a fighter from the Philippines who has an underwhelming record of 29 wins (14 KOs) and 12 loses. However, he has won his last twelve fights and has got himself into the high-ranking positions of WBC #3 and IBF #5, and although only at #5 with the IBF, he is the currently the highest ranked contender behind Paul Butler and Emmanuel Rodriguez, who have just fought for the vacant title. According to the IBF, when a vacant title has been won, the victor of the bout must defend the belt against the next highest ranked boxer within 6 months. This would satisfy that obligation if Rodriguez was paired off to dance with Yap in the quarter finals and would keep another belt in the equation. To finish then I will list the fighters I would like to see in a 118lbs WBSS tourney, and in the order, I suspect they will be seeded: Inoue, Burnett, Tete, Rodriguez, Payano, Solis, Gaballo and Yap. The winner of this tournament would own the one and only WBA title, the WBO title, the IBF title, and The Ring Magazine Belt, and would unquestionably be the Linear Champion of the Bantamweight Division. Who would the reader like to see in the upcoming Bantamweight WBSS? And what weight class other than Light Welterweight would they like to see involved? Keep an eye out for my second part for this article where I will be sharing the fighters I would like to see in the 140lbs tournament and my reasons why.